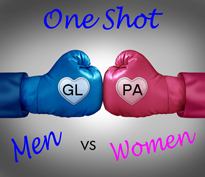 "One Shot-Women vs Men Competition"
This night is one of the most popular events at GLPA. This friendly fun, rowdy, but competitive contest pits the men against the women photographers in the club. This is the only night that seating is segregated. Each team must sit on their own side of the room. Cheering and showing support for your team is mandatory. We will also serve refreshments and a little libation that night. There are twenty-five image categories for the contest. On the night of the competition we will have a judge- yep only one male judge this year- and that is the only hint you will get on who it is. He will pick the image that he feels fits the category best and that he views as the best image. The team with the most winning images wins the One Shot contest, earns bragging rights, and has the trophy turned to display their team name- women or men for the year. The judge is sworn to secrecy until that night. Along with the ‘One Shot’ on the same night is our famous ‘Cook Off Dessert Raffle’. Please see the Cook Off page for full info. Don’t miss this most popular night of the year. Ladies wear red and your blinkies. I tried to post the picture of Ken Jordan turning the trophy to the men’s side last year but I have conveniently misplaced it in my computer files. So sorry to the men. We will get a new picture of it moving back to the women’s side this year and I will write myself a note where it is stored for next year.